Get MBOX viewer - a true freeware with transparent interface! 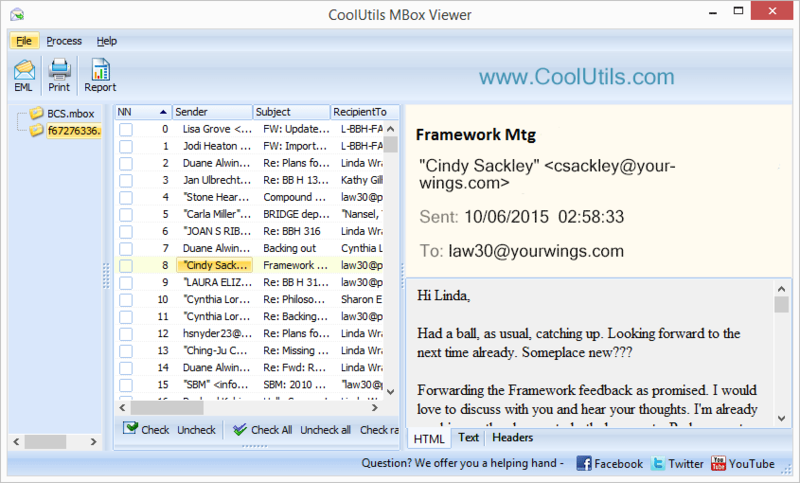 You are here: CoolUtils > Mbox Viewer > Get MBOX viewer - a true freeware with transparent interface! Due to the concatenated (long string of text) nature of the MBOX format, it can be a challenge to work with. Fortunately our free MBOX Viewer provides you with all the solutions you need to make working with your MBOX files quick and easy. Whether you're looking to make sense of the data, create a user-friendly PDF, or export to an EXCEL sheet, CoolUtils' MBOX Viewer can help. To learn how to get started viewing MBOX files on your hard drive, check out our How-to guide located below. Begin by launching the MBOX Viewer. With the viewer open click File. From here choose either Open profile... or Open mailbox... to let MBOX Viewer know where to look for your MBOX files. Once the files have been located, choose which files/folders to work with by checking the box next to their name(s). With your files selected, click on the Report icon to open the Report options interface. 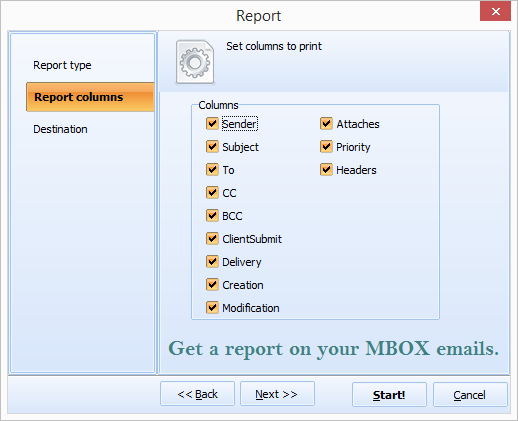 Next, choose the Report type for MBOX Viewer to create a report in; TEXT, EXCEL, CSV, PDF or HTML. Now it's time to choose which pieces of metadata to parse out of MBOX file(s). Click on the Report columns tab to reveal all the various categories used to filter report results. By default, all categories will start out in the checked state. To remove certain categories, simply click the box to uncheck it. Afterward, it's time to select your Destination. Here you can name your new report file and choose where it should be saved. When you're ready, click Start to begin the conversion process. In this example, we've used the Report function of MBOX Viewer to demonstrate how to create a document that will let you make sense of your MBOX file. There are, of course, other options. 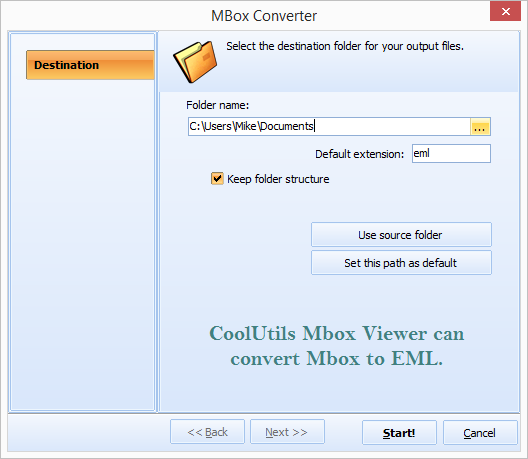 For example you can choose to Print your MBOX files or generate an EML file. (Creating an EML file will let you export your MBOX data to Windows Mail or Outlook Express). Did we mention that the MBOX Viewer is free? Download your free copy today and see why Coolutils is the #1 name in conversion utilities!